USA’s Skateland of Mesa, AZ, is an excellent choice for a family outing or hanging out with friends. Visitors are welcomed into Skateland by energetic staff ready to assist. Their main attraction is the roller rink, yet the facility has more to offer. Skateland will host birthday parties, many special events, and groups of all sorts. Video arcade games, dancing, free WiFi, and a quality cafe are among the things you will find at USA’s Skateland. The roller rink its self is lit with fun and lively colors. Skateland’s beloved mascot can all so be seen skating about the rink, interacting with kids. Open skate times are available for kids, teens, and even for adults to enjoy. Rollerbladers are accepted and may also participate in the fun. Both Rollerblades and skates are ready to use and rent from the facility. Skateland also provides special nights reversed for adult to skate and dance to live DJ Music. 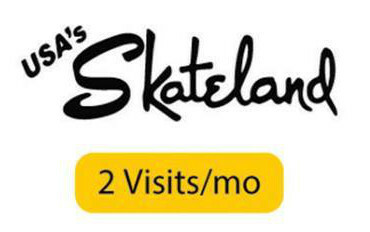 To assist first timers, Skateland will have skate mates to skate besides you and help you out. However, every Saturday morning there are skating lessons to help you become a better skater. These classes are open to all ages and taught by certified instructors. There is no registration to take part in these lessons all you need to do is show up. Skating can work up quite an appetite. This is why Skateland has a full service cafe. Their menu has some of America’s favorate foods and beverages. As well as pizza, churros, icees, and other sweet treats. Skateland’s arcade has over 20 games of all types. Many flashing lights, buttons and beeps, and saving the world one zombie at a time. Perhaps you just don’t feel like skating, that doesn’t mean you can’t have a great time at their arcade. Have some friendly competition and earn tickets to win fabulous prizes. On top of everything else, Skateland has kids camps throughout the summer! Children can meet new friends and join in skating activities. Your kids may play games, make crafts and tons more. Great meals and snacks are provided and severed during the day. This is a safe summer experience for your kids in a comfortable air conditioned facility. USA’s Skateland is an exciting place for making memories. Want to visit USA’s Skateland more then once? With a Pogo Pass membership you can have free admission twice a month! A Pogo Pass allows you to visit many other intriguing places for a one time fee. Currently a Pogo Pass is 60% off with the promo code!